Things have been super busy lately, with finishing finals, moving back to DC, and starting a new job. Luckily, I did manage to squeeze in this enchanting YA fantasy during finals. Meira is an orphan from the conquered kingdom of Winter, on the run with a handful other refugees, including the heir to the Winterian throne, Mather. They're on the hunt for their kingdom's magic pendant to reclaim their kingdom, while hiding from the Spring kingdom's leader. Meira, Mather, and the other characters that pop up are excellent. Major bonus points for a love triangle where both the interests are interesting, and you can actually understand why Meira would be torn between them! The world-building in this series is fascinating. There are four season kingdoms and four rhythm kingdoms. I'm not totally clear on why the other half is rhythm, but sure. In the past, all the kingdom's leaders got together and decided to put their kingdom's magic into an emblem they that can use to rule and give their power to their subjects. Each kingdom has a different specialty that affects the way they use their magic. I can't wait to read the next book, due out in October, just to see more of these kingdoms. But I have a big complaint. SPOILERS COMING, skip this paragraph if you're not interested! Highlight to read the text if you don't mind. So, if you follow me on twitter, you'll know that as I was reading I loved the twists that kept coming throughout the novel. One of the things I was most loving about the book was seeing a main character who wasn't the chosen one, but was supporting the heir & strong in her own right, despite her non-special heritage. Meira's receiving visions from the former Winterian queen that help her understand more of the magic of the kingdoms, awesome! Common people can wield magic and she's going to be a normal person bringing it back! Great! Except, turns out she's actually the heir & was switched with Mather to protect her. Yawn. Maybe this is a case of my wanting the novel to be something it wasn't, but this predictable "twist" turned the thrust of the second half of the novel into a big old trope. Don't get me wrong, the world-building and characters will keep me reaching for the second, but I was pretty disappointed at the predictability, since I had really been digging the normal girl at the center. Finally, the audio narration is fantastic and really added to the book. Kate Rudd is just the right amount of enthusiastic and engaging. Highly recommend the audio on this! Verdict: Jury's out - if you're a fan of YA fantasy, it's a solid choice. Not a stand out if you're not already a fan, since the ultimate twist is fairly predictable. I'll definitely be listening to the second! 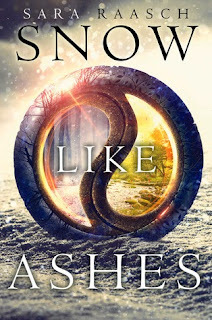 "Snow Like Ashes" by Sara Raasch, published October 14, 2014 by Balzer + Bray. Audio narration by Kate Rudd, published October 14, 2014 by Harper Audio.